The spirit that drives Shonen Knife was apparent in the song that played over the PA as they left the stage: The Ramones’ “Sheena is a Punk Rocker.” While Shonen Knife didn’t play any of their excellent Ramones covers for their 1,000th show, held at the newly remodeled Turf Club, all of their music displayed how that thunderous punk rock heart of The Ramones is so important to Shonen Knife. With the recent death of the last original Ramone, Thomas “Tommy Ramone” Erdelyi, being reminded how their soul and energy remain alive in bands today was comforting and up lifting. With their recent album Overdrive, Shonen Knife added some new tricks to their repertoire with riffs that harken back to 1970s albums by AC/DC and Black Sabbath. It says a lot about the longevity of their career when the three songs off Overdrive–“Bad Luck Song,” “Ramen Rock,” and “Green Tea”–are just as strong (if not stronger) than many of the fan favorites they played during the set. Founder Naoko Yamano was joined on stage with more recent members Ritsuko Taneda on bass and Emi Morimoto on drums. The three emerged on the stage dressed in matching, but not identical, dresses inspired by Piet Mondrian’s Composition No. 10. You know the one, all black lines and alternating rectangles of white and prime colors. The dresses added an art pop element to the show, and a reminder that though the music and lyrics of Shonen Knife may seem simple, it is the work of talented artists choosing to work within the confines of a certain medium. It also harkened back to the cover of one of their early 90s EPs, We are Very Happy You Came. They opened with “Banana Chips” which put an instant smile on the packed crowd. The 30 years of stagecraft that Yamano has learned was just as evident as that Ramones beat. “Bad Luck Song” took that point even further as Yamano and Taneda perfumed synchronized guitar strums ending the devil horn rock salute. From any other band, such choreography would seem crass or cheesy; there was never a sense of that with Shonen Knife. Maybe it was the giant smiles on their faces as they played, the enthusiasm the crowds picked up on and pogoed to, or the sheer happiness of their songs. Taneda’s “Ramen Rock” showed off newer influences of AC/DC, while Morimoto’s “Green Tea” laid its foundation on Black Sabbath style stoner rock riffs. The band then went into a set of songs from through out there career chosen by fans on the internet, starting with the excellent “It’s a New Find” and the first song off their first album (as stated by Yamano), “Miracles.” Though Yamano’s sister and former band mate Atsuko was unable to attend the show due to illness, the band stated before hand they would still play her songs. The set included a short cover the Beach Boy’s “Don’t Hurt My Little Sister,” The Rutles “Goose-step Mama” and their own “Pop Tune” in the set. 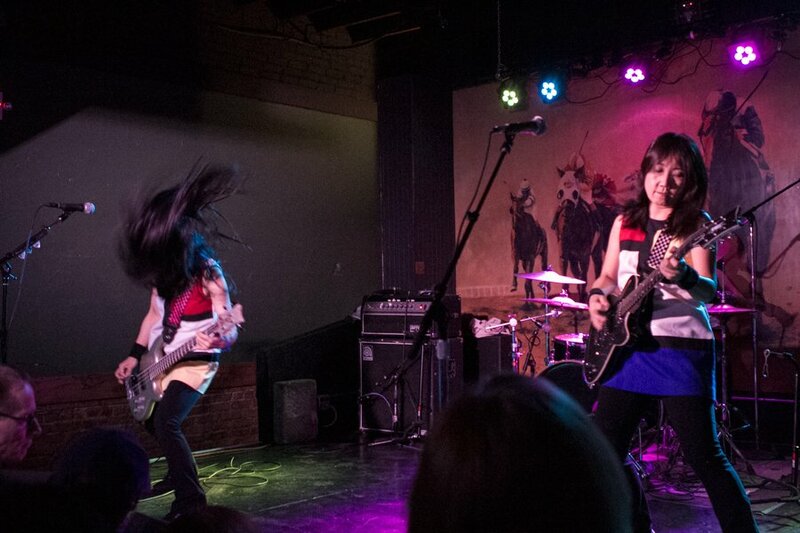 It was during “Pop Tune” that it became clear that the proper words to describe Shonen Knife’s brand of loud, raucous, and energetic rock ’n roll do not exist. There is simply no other band like them. No one can rock The Carpenter’s “Top of the World” like they do. No one can write songs about cats and food and make it seem important and so very rebellious like they do. And then write even more songs about cats and food. Shonen Knife might be one of the best bands, truest to the heart of rock n’ roll. Overdrive might be one of their best albums. Their 1000th show might have been one of their best shows. That original rock ’n roll spark that gave rise to The Ramones was certainly on display at their 1000th show, and that might be all that matters.